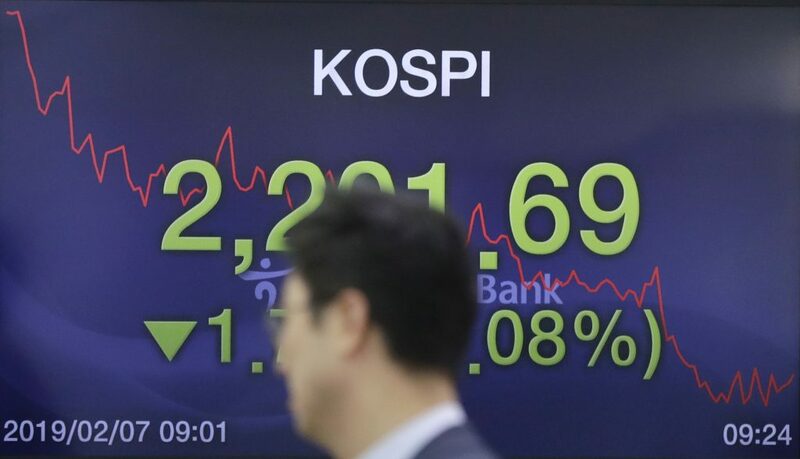 Asian share markets hovered near four-month highs on Thursday with Australian equities the star performer while the New Zealand dollar sank after disappointing jobs data prompted investors to narrow the odds of a future rate cut. Trading was still light overall with China on holiday and no major economic data on the diary. MSCI’s broadest index of Asia-Pacific shares outside Japan added 0.1 percent as it rose to its highest since early October. The index has risen steadily since early January as the U.S. Federal Reserve changed its tune on policy for further rate rises. Australia’s benchmark stock index jumped 1.2 percent amid expectations of easy monetary policy after the country’s central bank chief shifted away from his previous tightening bias. Japan’s Nikkei slipped 0.6 percent. The positive sentiment in Asia was unlikely to extend elsewhere with spreadbetters pointing to a weak start for European shares. London’s FTSE futures was down 0.2 percent as were E-Mini futures for the S&P 500 and Dow . The next major trigger for markets will be any breakthrough in the U.S.-Sino tariff talks when the two sides meet in Beijing next week. President Donald Trump offered little new to chew on in his State of the Union speech but Treasury Secretary Steven Mnuchin said on Wednesday he and other U.S. officials will aim to clinch a deal next week to avert a March 2 increase in U.S. tariffs on Chinese goods. “Investors are continuing to look for clarity on the trade situation between the United States and China, and as the trading days drift by with no concrete update on progress then markets become more and more concerned,” said Nick Twidale, analyst at Rakuten Securities Australia. “Probably more pressing for the U.S. markets is the threat of another government shutdown,” Twidale added. In currency markets, the early mover was the New Zealand dollar which slid after data showed unemployment, job gains and wages growth all missed forecasts. The kiwi slid to $0.6744, losing nearly 2 percent in the past 24 hours, as investors wagered on the risk of a cut in interest rates. Bonds rallied hard, with two-year yields dropping 8 basis points to 1.66 percent, well below the 1.75 percent cash rate. The Reserve Bank of New Zealand (RBNZ) holds its first policy meeting of the year next week and markets are betting it will adopt a dovish stance. Its neighbor, the Reserve Bank of Australia (RBA), caused ripples on Wednesday when it tempered a long-standing tightening bias and indicated the next move in rates could just as well be down as up. The Aussie dollar duly dived 1.8 percent and gave a broad fillip to the U.S. dollar. The dollar index has now risen for five straight sessions to reach 96.44, recovering almost all the losses suffered after the Federal Reserve all but abandoned plans for more rate hikes. Less lucky was the euro, which was dragged back to $1.1359 in the wake of a dismal reading on German industrial output. The dollar could make no headway on the yen, which benefited from its own safe-haven status, and idled at 109.95. The broad dollar gains put pressure on gold, which eased to $1,303.96 per ounce, slipping further from last week’s top of $1,326.30. Oil prices eased too after U.S. crude inventories rose and as production levels in the country held at record levels. Brent crude futures slipped 23 cents to $62.46. U.S. crude eased 19 cents to $53.82 a barrel.